People and Passions: Award winning actress Vilma Santos Recto tackles her greatest, most challenging role yet as governor of Batangas. Early dawn breaks in Batangas just as the clouds lose their heaviness, turning what have been just minutes before a towering, threatening storm-bearing mass to silky, wispy firmaments as harmless as spun cotton candies. In this tangerine-bathed panorama, just as the first fingers of the sun’s rays peek through, the landscape in the first few hours of the morning becomes absolutely breathtaking. A place is always beautiful after it is cleansed free, and the wind and the rain have drawn out from the drenched earth a profusion of scents. Here, in this rugged, coastal province, it’s that wondrously intoxicating smell of coffee beans, the saps of early July-harvested mangoes, the aged bark of malabayabas that grosw unimpeded in vast, open spaces, the wild horses in the ranches of the hacienderos, and dozens of unidentified ones, layered on top of each other, crisp and musty, and unexpextedly, nostalgia-inducing. Over two million people will wake up to this olfactory overloaded vista, and one of them will have spent the last night pacing, nervous and exhilarated, all but oblivious to the tug of was between light and day, sunshine and monsoon rain, bullfrogs and crickets. V FOR VOTES – VILMA SANTOS RECTO wouldn’t have noticed the gentle transformation of daylight. She was too busy going over the notes, trying to run through, for the umpteenth time, in the corrections she has scrawled all over her paper. Today, the scond of July, is officially the first day she’s taking over this province of 300,000 hectares, a population of tough, weather-beaten Marlboro Country men whose pastimes include taming wild horses and brandishing homemade balisongs (fan knives that natives purportedly carry everywhere they go.) So her anticipation is weel-placed, although you would not know by the stoic look on her face as she alights from the black van carrying her to the Kapitolyo, the official residence/office of the governor. After all, the multi-awarded star is still the country’s best actress. Solemn in her Paul Cabral barong, a long-sleeved creation with floral appliques, and her soft black slacks and pearls, she still looks like the huge movie star that she is. Never in the history of Batangas has a new governor been deluged with media-flashing light bulbs, mobile newrooms, mics thrust on their faces, and persistent camera crews – on the first day of assuming their posts. With the rolling lawns of Laurel Park dotted with acacia trees as backdrop, it may look just like any other expensive production set of a movie starring the Philippines’ best actress. The neo-Classical structure of the Capitol is bravado personified, a men’s man’s lair if you will, with four Greek columns signifying, if not pillars of strenght, then phallic pro[portions. On the second story’s walls, there hang framed portraits of the men who ruled coffee country. Men, take note, not a single lady in its almost 500-year history, of varying pedigrees and popularity. This is the province that produced not a few of our good men: flag-maker Marcela Agoncillo, Apolinario Mabini, General Miguel Malvar, among others, prompting many to call it “the cradle of heroes and nationalists. ” It is with this burden, standing on the shoulders of giants, plus filling their shoes, that rests on the elfin frame of seasoned star and politician of mere nine years VILMA SANTOS RECTO. “Oh my God, this is it,” she recounts, with a little shiver when asked what went through her mind as she woke up, or rather, met the day head-on. “I really wasn’t able to sleep well. I was trying to remember what else I wanted to say. Of course, I was nervous, but at the same time, prepared.” She glosses over the fact that she’s the first woman to come to the Batangas Capitol, the bastion of male supremacy in the country, if, indeed, there is one. “I think this is the first time for a governess,” she quips, luaghing. “Governess, parang yaya.” This may be but one small step for VILMA, but it is a giant leap for womankind. Her nine-year administration in Lipa as a city mayor is also a first time for a woman. “I believe in women empowerment, ” she stresses. “What you can do, I can do better. I respect you, but respect me, respect my ability, respect what I can do. I won’t tolerate not beign respected.” If she’s sending out zingers to God-knows-who, we can only guess. There are the usual suspects, like ex-governor Armando Sanchez, who did not concede without putting up a fight. “You konw what, I did not even think about the preparations leading up for today,” she intimates as we talk in her barely-furnished governor’s office. The only personal touch you can see around is a picture of her family – erstwhile Senator Ralph Recto, sons Luis Manzano and Ryan Christian – in an informal pose that might’ve been taken in one of their many holidays together. Earlier, she had done the rounds of the Capitol, her first, and proclaimed it needed her signature look. “Even a week before this, issues were coming out,” she intimates. “Talk was flying about how they would stop me from assuming my post, about TROs, about how I shouldn’t be too sure I would be starting (today). Those were really my concerns. I would have been prepared to face them, you know.’ But the day has come and gone without upheavals and she says she thanks the ex-governor. “If he wants to join me for the good of the province, he is very welcome,” she intones, smiling. Amelia Lipata, a messenger who has worked for the governor since 1998 when she was sitll campaigning for mayor, sums up what thousands of provincemates think about their leader. “Abunado pa si Ma’am. Ang dami n’yang natutulungan. Minsan inaabot ng dilim. Lumalabas kahit sa mahihirap na bayan. Mas malayo nga ‘yung bayan, mas priority pa ‘nya (She’s not profiting from this. She helps a lot of people, and the further-flung a town is, the more she prioritizes it).” “One thing I can brag about my leadership,” Vilma says of her past administration, “is that the whole time I served, I served without politics. The people who didn’t vote for me, the barangay kapitans that weren’t mine, nakuha nila ng buong-buo ang serbisyo ko (they got my full service).” What fuels Vilma as a politician, this unerring desire to give a hundred percent, perhaps take its roots in her background as a young, working actress at age nine. She won her first FAMAS award for Trudis Liit and has continued to reap many more in the years to follow. For a child to have gained recognition that early must have left an indelible mark on the young thespian. In more ways than even Vilma herself can comprehend, she has always felt the need to rise to expectations and, for her, that has become a way of life. VIVA VI! Woman power reigns supreme as VILMA SANTOS RECTO takes her place as governor of what used to be the domain of the barako, a man’s land, the province of Batangas. V FOR VALUES – “I’m so blessed to be loved , but I can’t answer that,” Vilma truthfully replies when asked how she feels to have reached a mythic status, idolized, and, in the pantheon of modern day gods and goddesses, revered beyond reason. Today, over lunch at the Mansion, a nearby residence constructed during the American occupation, an octogenarian Vilmanian has come bearing a gift of beautiful (and huge) South Sea pearls from her own farm. The old woman had asked Emelyn, Vilma’s older sister, to please have Vilma wear it on her first day. Another, a teacher, has come all the way from the Visayas to witness this new era in her idol’s life. In her order of priorities, family comes first. Every so often, she and her family retreat to out-of-the-country vacations to recharge from the daily stresses. This is what keeps her sane, and she counters, effective. “Problems are the greatest reasons for getting old,” she laughs. “I am fifty-three and yet still have energy, only because I am truly happy and comfortable with life.” She still does tae-bo twice a week and swims on weekends to keep her trim shape. “I am still an actress,” she proffers. But that’s the extent of how the well-preserved actress exudes efforts to preserve herself. Although she’d splurge on Gucci and Ferragamo, Danilo Franco, JC Buendia, and Paul Cabral, she has never undertaken extreme measures like facelifts or surgery to look and feel good. “I don’t even have a beauty regimen. I have nothing against Botox, but I’ve never tried, not even once,” she admits. “But I’m still fine and, honestly, I have other things to do.” Then she says with aplomb, “Hindi pagiging matanda ang importante, ang pinagkatandaan (It’s not about aging, but how you age). Everybody grows old. Nothing’s going to stop it. I just want to do it with grace.” A politician of nine years, VILMA takes her seat at Batangas’ Kapitolyo, on the stength of 475,740 votes and 5,849 precints won. TRIPLE DUTY. VILMA plays multiple roles in her present life – sometimes an actress, foremost a mother, and always the leader of Batangas. V FOR VICTORY – At exactly eight in the morning, as the returning sun beats with a vengeance down on the crowd gathered at the lawn in front of the Capitol building for the first official flag ceremony, VILMA SANTOS RECTO takes her place among the leaders, old and new, of Batangas. The employees, most of them who have grown up watching the governor take on her many roles as an actress, are skittish and excitable. You get a sense that, for them, the petite, five-feet-flat actress is just portraying one of her award-winning roles. No, she isn’t really going to be the governor. Look, she’s beside the more imposing ex-governor Antonio Leviste and the suave, smooth-talking provincial administrator. It still feels surreal. Cameras from cellphones flash, and even during the somber flag-raising, all eyes are trained on her. She’s aware of this, even if at the moment, she doesn’t let on. “Every day is still a learning process for me,” the newly-appointed governor shares thoughtfully a few hours later, back at the cool confines of her office. “I’m apprehensive about the expectations. I just want to be magnanimous about the victory I got. People need to understand my priorities, support them, and do what they need to do. This is not even for me, you know?” Judging from the still star-struck faces of most, it’s a reality that may take a while to set in, but the tough politician who’s turned a city around is not one to easily give up. When she takes the stand to speak for the very first time as their governor, a quiet, expectant hush falls over the crowd. You could hear a pin drop. And then Vilma, who never disappoints, gravely said, “We’re all in this together. Kami dito sa stage walang payong, kaya ibaba ninyo ang mga payong ninyo. Kung kami maiinitan, lahat ay maiinitan (We don’t have umbrellas here, so fold yours. If we take the heat, so should you. )” There’s a moment of silence before giddy laughter erupts and then from somewhere, scattered burst of applause cracks the stillness until the whole plaza joins in, and as they have always been since she was nine, people unwittingly feel under Vilma Santos Recto’s magic spell. The first lady governor of Batangas smiles triumphantly, surveys her audience with a fond look, and steps up to the dais, bravely facing the dawning of the new day. The End – Source: Senses and Style, August 2007 Issue By Krizette Laureta Chu Portraits Rudy Liwanag; Text transcribed by Alfonso Valencia posted at the VS Yahoo e-groups. 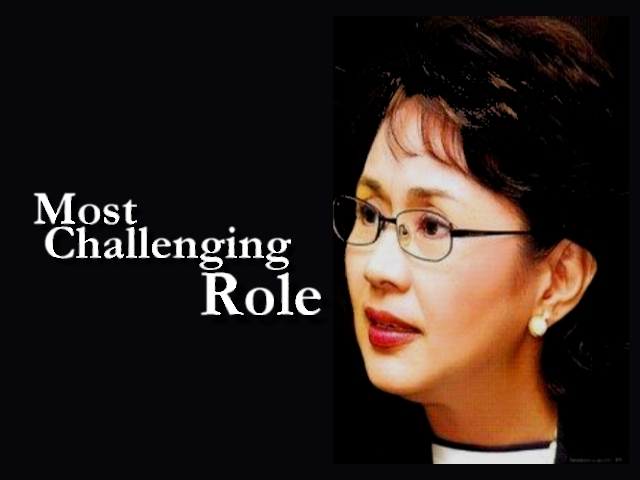 This entry was posted in ARTICLES and tagged ARTICLES, Most Challenging Role, Vilma Santos. Bookmark the permalink.